There’s a thing in sewing land called “Me Made May”. It is a Good Thing – people who make their own clothes pledge to wear them throughout May, basically. It was created by Zoe Edwards (read on for more on Zoe) 9 years ago and its getting bigger every year. And having a go at wearing a big bonkers headband, outside in public, or something. Probably. “Eek! I haven’t got enough things. I need to sew more things!” There was scuttling off to fabric shops and online browsing. Then I stopped and remembered that I’m trying to clothe myself in an eco-friendly and sustainable manner. And y’know, try to look nice. Me Made May is about loving what we have, not wanting more. So I’m combining the concepts of Fashion Revolution with Me Made May, with some help from some very influential members of the sewing community. I am feeling the love for three wonderful sewing women who have helped me decide on what to pledge for Me Made May. The creator of Me Made May, for her commitment to sustainability and for making it easier for us to make in a more mindful way. You don’t have to wear me-mades every day to join in, although I will. However, I can’t pass it off as a challenge seeing as I’ve been wearing me-mades every day for about a year already. So here is where my second wonderful woman – Elisalex de Castro Peake comes in. Create less demand for new fabrics by using up what’s already out there and get refashioning! Charity shops are a treasure trove of fabulous fabrics just waiting for a new lease of life. Get on board the mending trend and show off tears, stains and moth holes with embroidery, visible mending and patches. And finally, don’t forget about that free fabric shop you have in your own home – your stash! Get involved with initiatives like #makeyourstash and don’t buy more of what you don’t need (for now 😬). She also gave great advice for our choice of fabric shops, but I’ve decided not to buy fabric in May. This is because buying ethically isn’t a challenge for me, but using up what I already have is. 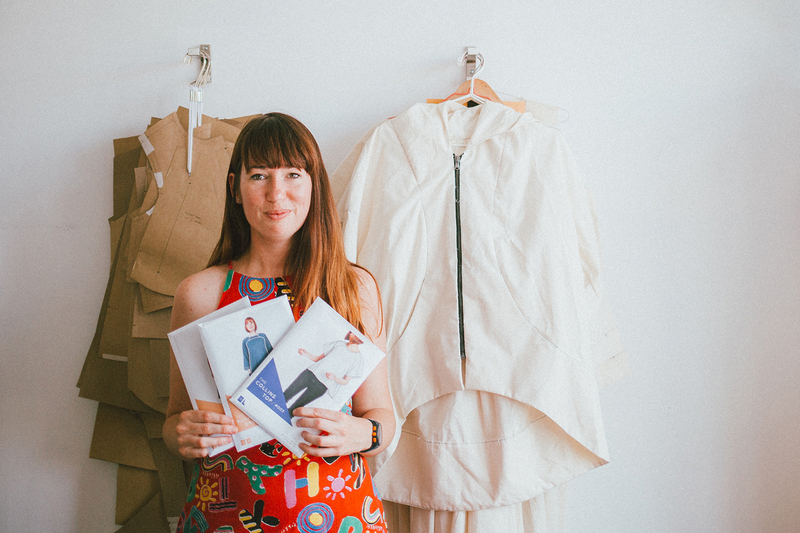 My third sewing crush today is Emily Hundt, because she created Makers for Fashion Revolution. Emily is the founder of an indie sewing pattern company In The Folds, and the creator of Makers for Fashion Revolution, or #makersforfashrev in social media land. She gives us makers ways we can help bring about positive change. Yay that. Work out ways to reduce waste (this could be in relation to your studio / office space, the packaging you use to wrap or post your products, etc. Make plans. Don’t buy things impulsively. Take the time to think about it and work out if you actually need it. My pledge therefore, is to spend a month appreciating and embellishing my handmade clothes, and sewing new things from charity shop finds. Wear everything! I’m going to get everything out and give it a day in the sun (figuratively speaking only, this is the UK). Even those dodgy early garments with all the wonky. Embroider everything! I will see what I can do to posh up those sad bland tops and trousers I have been neglecting. With embroidery!! There may be comical results. Selfless something! I will sew for the people I love in May. My husband is patiently waiting for the shirt I promised him for Christmas, 3 months ago. Time to get shirty.